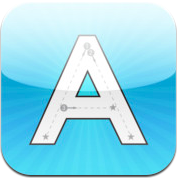 This is a fantastic app to reinforce handwriting skills. The tracing exercises are fun and filled with positive reinforcement. From Kumon, the world’s largest supplemental learning provider and parent to Kumon Math & Reading Centers, the Uppercase ABC’s app includes a Letter Tracing Activity (with their unique and simple method of tracing letters) and a Letter Sounds Game (match the written letter with its sound read aloud). The tracing progresses as the circle and stars disappear. Then the dotted line leave as well to allow for freeform! There are three forms to choose from including alphabetical, random, and Kumon.